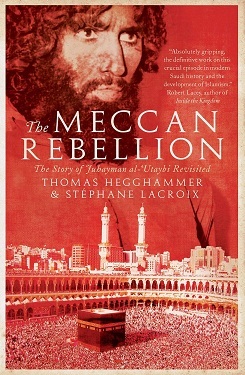 I’ve just read Hegghammer & Lacroix on The Meccan Rebellion. At 78 pages and 5.3 x 8.3 inches, it’s a tiny book in hardback and quite a delight to hold — the electricity in my city block went out for a while the other day, and I took pleasure in reading it out under the sun — and it contains, in essence, the two authors’ paper, Rejectionist Islamism in Saudi Arabia (Int. J. Middle East Stud. 39 (2007), 103–122) and a companion piece by Lacroix titled Between Revolution and Apoliticism: Nasir al-Din al-Albanai and his Impact on the Shaping of Contemporary Salafism. Blog posts tend to present a point of view – whether to preach to the choir, promote it to unbelievers, stir up trouble, or simply add detail or a fresh angle to an existing narrative. Seldom do they ask questions. My own instincts — in line with Madhyamaka as I briefly encountered it in the teachings of Elizabeth Mattis-Namgyel — lead me to leave some kinds of questions open: I use my DoubleQuotes format to set the juices flowing, by providing nudges to thought rather than outright statements – but on this occasion I have a question to ask, and as it’s too long for Twitter I’ll post it here. Here’s my question. Juhayman al-Utaybi believed one of his companions, Muhammad al-Qahtani, was the Mahdi, the awaited Coming One of Islam — and that, in our authors’ words, “consecrating him [al-Qahtani] in Mecca on the turn of the hijra century” would ”precipitate the end of the world”. In my view, a great deal rests on that simple word, “precipitate”. Would “usher in” do as well? Or “mark the beginning of” perhaps? Or is the idea of forcing the hand of God present, as it is in Reuven Paz’ phrase, “hot-wiring the apocalypse”? There’s a lot riding on that issue: whether or not it is possible to force the hand of God, to accelerate destiny, to hasten apocalypse. The Jihadi and nationalist insurgency in Iraq, which feeds the motivations and enthusiasm of growing number of Islamist youth to search for Jihad, look for the “culture of death and sacrifice,” and self-radicalize themselves, is another factor in the growing sense of Jihadi pride, which also hotwires the sense of the apocalypse. Only when we understand the eschatology currently driving Iranian foreign policy, can we truly begin to understand how dangerous the regime in Tehran is. Only then can we fully appreciate how events like the revolution underway in Egypt only encourages Twelvers like Khamenei to take still further provocative and perilous actions to hasten the coming of the Twelfth Imam. So the idea is afloat that both Sunni jihadists in Iraq and the Shi’ite state of Iran ay be about the “hastening” business. And if I might ask a follow-up question — is the first of the Juhayman Letters, which is devoted to the theme of the coming of the Mahdi, available in English?